Designer Sascha was born in Ulan-Ude, Russia, a town in Eastern Siberia that borders China and Mongolia to the South. Life in a small town in the post Soviet era was not easy. Though her grandmother, Shura, was entrepreneur and had her own fur hat business, money was very tight. 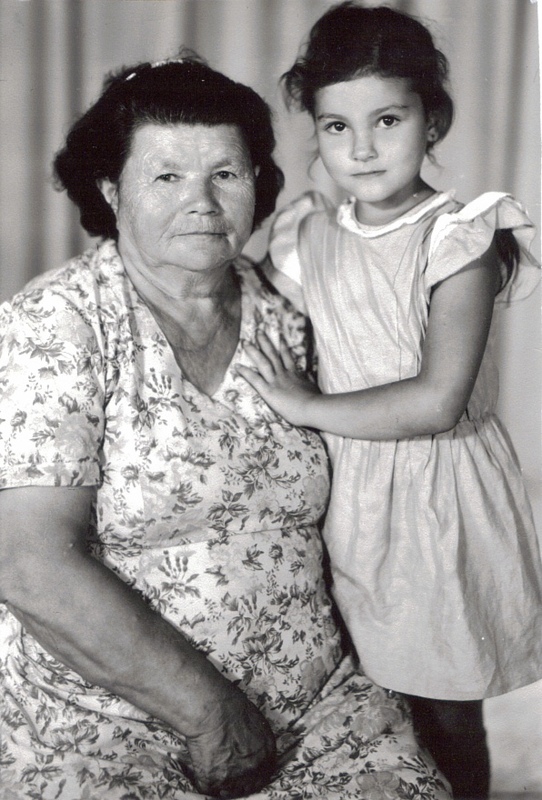 Sascha and her grandmother Shura. The dresses are made by Shura. As a young girl, Sascha wished to dress like her classmates, sporting the latest fashions. Inspired by her grandmother Shura, Sascha decided to make her own skirts, dresses, and later pants, using Shura’s old Singer sewing machine and Burda Moda patterns. Sascha’s way of adding fun pieces to her wardrobe eventually turned into her favorite hobby. She would spend countless weekends sewing at her grandmother’s place. Sascha and her best friend Olya would make the same items, such as A-line knee length skirts, and show them off at their outings. Everyone who saw them out would think they were twins. Sascha and her best friend Olya (on the right) at the sewing class in high school. Sascha’s hobby grew stronger into adolescence, as well as her skill sets, confidence, and passion for creativity and experimentation. In the spring of 2009 after graduating college and living in Moscow for a little over a year, Sascha immigrated to the US and landed in New York city – the mecca of all things fashion. The fashion district quickly became her artsy playground where any of her designs quickly turned into finished garments. She was very quick to bond with local talent and find inexpensive ways to source anything from high tech fabrics to a button. Socially she naturally fell into a highly creative NYC community in New York: peeps who live and breathe radical self-expression, art and adventure, who love adorning anything from their apartments to festival costumes to building breathtaking art at the largest festival, Burning Man. Every get-together became a source for sharing inspiration, brainstorming ideas and art projects, fueling each other’s passions for creative self-expression. kova by sascha was born in March 2013. Sascha decided to challenge herself to be in charge of a fashion brand and have the luxury of creative freedom. kova by sascha has a goal of bringing high-end unique 3D printed head pieces to festival goers at affordable prices. Headgear that is hand finished and unique produced with respect to the environment. kova by sascha style is clean and simple with a hint of edge. kova by sascha’s main goals are protection of the environment, social responsibility, and educating consumers to be savvy and responsible with their fashion choices.